I have two dogs who are very messy eaters. One likes to take her food from the bowl to the carpet and eat it, while the other one pushes her food all around the food bowls spilling it all over the floor. Both of them drip water all over even with a rug under the feeders. 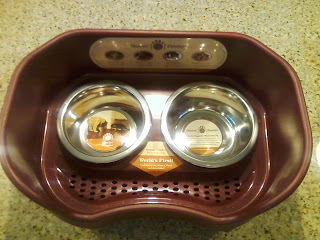 Neater Feeder is a feeding system for dogs and cats that keeps the spills and splashes contained. 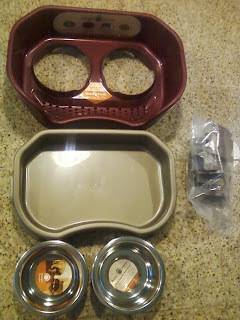 The Small Neater Feeder comes with a top reservoir, bottom reservoir, a food bowl that holds 1.5 cups and a water bowl that holds 2.2 cups. You can choose from two colors: Cranberry and Bronze and in a multiple sizes. The revolutionary, patent-pending design consists of an upper reservoir with a protective wall enclosure making a safe and secure space for your pet as it contains spills and reduces damage to floors and walls. 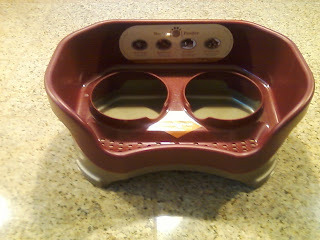 The front wall is contoured towards the bowls allowing your pet to reach the food comfortably. The filtering feature in the top reservoir allows the water to spill to the bottom reservoir while the food stays on top allowing for easy clean up. Adding the non skid piece into the leg extensions. They also have leg extensions to increase feeding height that can be purchased separately. These extensions come with non skid feet to prevent slipping. 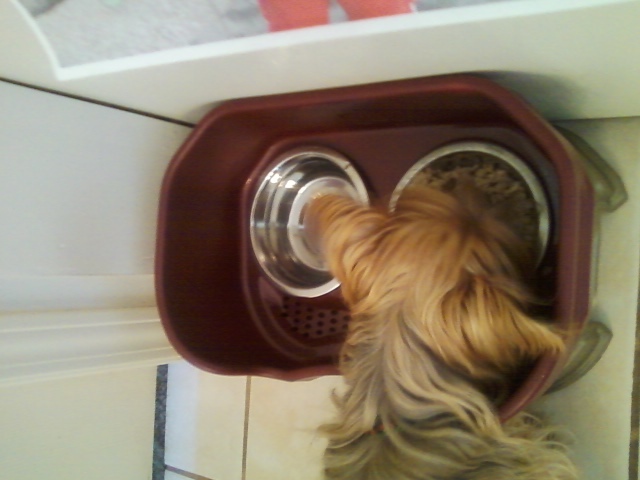 Trixie enjoys eating out of her Neater Feeder and mom likes no mess. 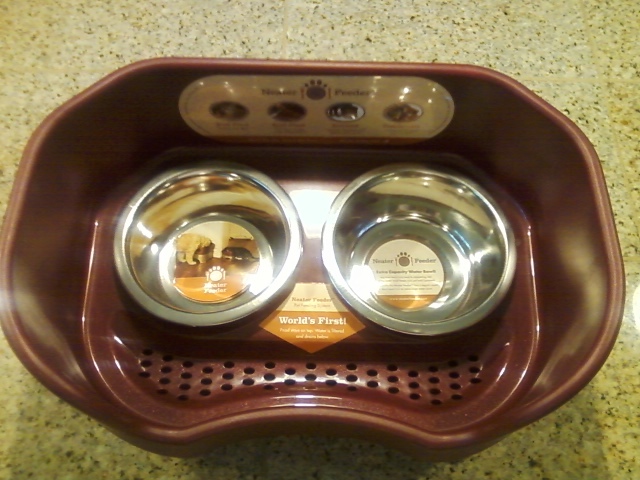 It was hard to decide which size Neater Feeder to get, with Trixie being a 6 lb Yorkie and Sierra an 60 lb. yellow lab mix. The tall one for Sierra would make it impossible for Trixie to eat and the small one would not hold enough food and water for both dogs. They were both sharing a 3 gallon size automatic feeder and waterer. I opted to get the small feeder for Trixie since she does not like to share and poor Sierra always had to wait till Trixie was done eating before she would get her turn. Now that she has her own eating dish and area, Trixie is much happier and stays at her feeder to eat and her area stays clean. It looks like I am going to have to invest in a big Neater Feeder for Sierra because her area is still a big mess. This feeding system is great because it is spill proof, if it gets accidently kicked the filtering sytem catches the mess, it is elevated which is a good position for digestion and joints and its contoured design allow for easy access for pets of all sizes. I can see why it has won several Editor's Choice Awards. Check out Neater Feeder online to find one the perfect size for your pet, connect with them on Facebook, Twitter, and YouTube see how it works and to hear about specials and promotions. Disclosure: Although the owner of this blog may receive compensation for the posts or advertisements, the views and opinions expressed are purely the bloggers' own. This post may contain affiliate links. Offers change or can be removed at any time without notice.#paid Frugal-Shopping is not responsible for prize/product shipment. I love that it comes in kitty sizes, as well! Our Max is generally a neat eater but this would do greatfor him. Thnaks for the giveaway. Would love a large cranberry one... I learned that it actually separates the spilled food from the spilled water! 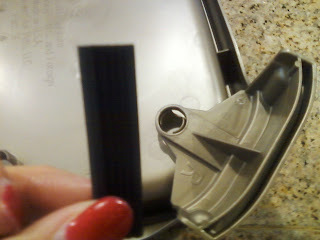 I learned that the Neater Feeder creates a healthier eating environment for my pet. I would like the cat feeder. I would like the large dog Neater Feeder. our two lil yorkies would love this! :)Medium would be great! I learned that the company is located in Malvern, Pennsylvania. Comments are moderated to help prevent spam which means they will not show up right away. If you are entering a giveaway make sure to leave your name in the comment otherwise I will not know who anonymous is. Thanks for commenting and have a wonderful day! This content by Margaret McLaughlin is licensed under a Creative Commons Attribution-NonCommercial-NoDerivs 3.0 Unported License. Based on a work at www.frugal-shopping.com.